Keto and the Holidays: 4 Reasons to Stay Motivated | Good Life. Better. 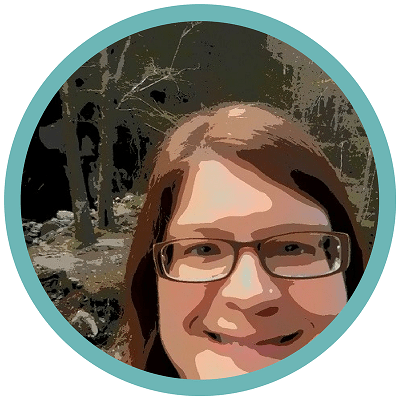 In January 2017, I started eating a ketogenic diet (i.e. low carb, high fat). I did so because I was struggling to lose weight and was intrigued by the idea of doing so without hunger, even if it meant eliminating entire categories of food from my diet. Eleven months later, I am down over 30 pounds and can confirm that when you stick to very low carb foods, you can lose weight without being hungry all the time. 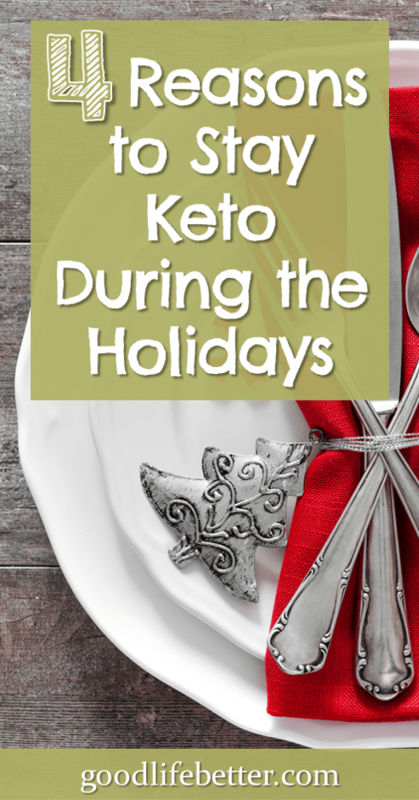 With the holidays approaching, however, I was a little nervous that I would be tempted by all the high-carb goodies making their way into the office or that will be on offer at holiday festivities. How do I stay motivated? Below are the four reasons I came up with to not indulge. What is a Ketogenic Approach to Eating? Small amounts of: sour cream, butter, mayo, spicy mustard, olive oil, coconut oil, unsweetened flaked coconut, creamy dressings, almond flour, and cream. I know it seems limited but you would be surprised by how many yummy Keto recipes there are out there. I am not a cook but one source for such recipes is a site I used when I was getting started, www.dietdoctor.com. 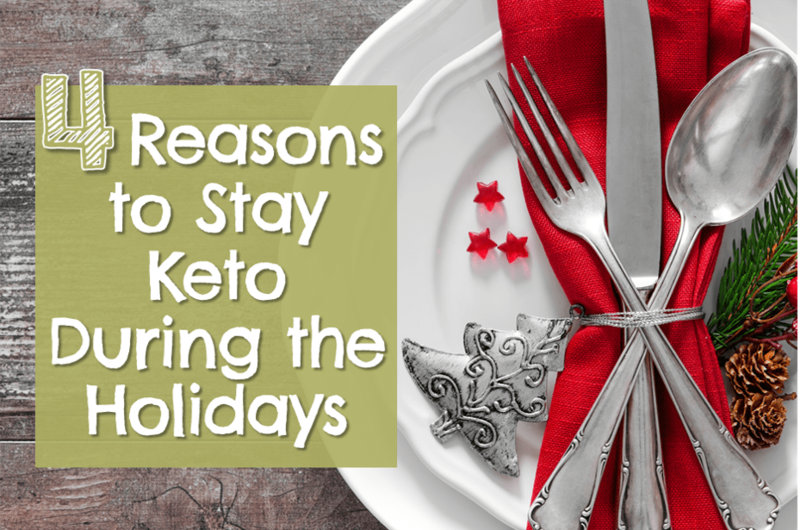 When I brainstormed reasons to not take a break from Keto during the holidays, I came up with what I thought were four very persuasive ones. If you have others, post them in the comment section below! The way I understand it—and admittedly, I am not a health professional—Keto isn’t a diet like Weight Watchers or Jenny Craig. When you enter a state of ketosis, it means your body is now using ketones for fuel instead of glucose. If you are like me and have insulin issues, it took time for your body to adapt to doing this. If you go back to eating a high carb diet, not only will it cause your body to switch back to using glucose but from what I have read, the next time you try to adapt it will be harder to achieve ketosis. This may not be true for you but if it is, do you really want to take that chance for a handful of cookies? I sure don’t! For me, Keto has meant—in addition to weight loss—more energy, clearer thinking, and what I consider the first normal relationship with food I can remember having (e.g., being able to stop when I am full, not feeling the need to binge). I won’t give these benefits up without a fight! I don’t know if this has been your experience but since I started eating Keto, my taste buds have changed. Foods—especially sweets—that I used to love just don’t taste as good. For example, while I don’t usually drink soda, I was in an airport late one evening and wanted something to drink other than water so grabbed a diet Mountain Dew. It wasn’t a drink I had often before Keto but it had been one I liked. This time, I couldn’t even drink a third of it before giving up. The flavors just weren’t the same. And this isn’t the only time I have experienced this. Tomatoes are practically a dessert now they are so sweet, and super bitter chocolate tastes almost like a Hershey’s kiss. If the food isn’t going to taste absolutely amazing, then there is no way I am giving up all that I have gained to eat it. I have often read that it takes 28 days to establish a habit. I don’t know if that is true but I know from personal experience that breaking a habit doesn’t take nearly that long. Face it: not every day between Thanksgiving and New Years is a special day. If you treat it as such, then when the new year starts and you are trying to re-establish the habit, just think how much easier it will be to deem all Tuesdays special, or Friday nights, or any other day when your are faced with a box of donuts or a platter of nachos. Just stay the course. Ultimately, for me this may be the most persuasive reason of all: I don’t want to gain back any of the weight I have lost. If you are younger and have a faster metabolism, this may not matter as much to you but as someone in her 40s, I have to fight for every loss on the scale. I like my clothes fitting better, and not getting out of breath walking with my friends. I like that my joints don’t ache as much and that I don’t have to worry if the seat belt on the plane will close. I like these things more than I like cake and pie and even sugar cookies in the shape of snowmen decorated with frosting and little candies. This is my motivation. Hopefully these reasons resonated with you and will give you the motivation you need to plan ahead when you go to your office holiday party, or are serving up mashed potatoes to your carb-eating relatives. 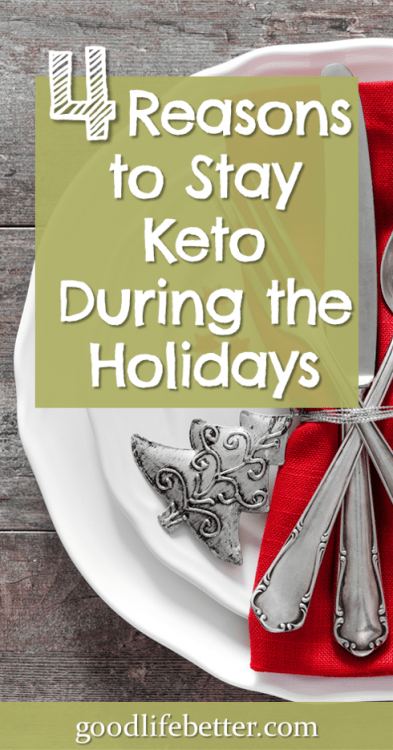 Staying Keto isn’t depriving yourself this holiday season but giving yourself one of the best gifts of all: health. Let me know in the comment section below your reasons for staying Keto! Want more helpful tips? Click here to follow me on Pinterest!